So summer! I like the color of the more reasonable version. So nice. Great find on the cheaper version. what a great find! i'd save and go for MIA, no doubt! Oh, I could go for the cheaper version. So great to have a cheaper alternative. Personally, I love them both! well since I love them both, I'd probably go for the cheaper version- knowing I'd be just as happy! I love mia! They were my first "hip sandal" when I was a freshman in high school. I will always stand by them! Love that I think I could actually wear these, although they would make me very tall, lol. LOVE the Mia version, I couldn't tell which was more expensive! I am so looking for a pair of nice wedge. hoooow cuuuute... i do like the mia version better, actually! it's maybe not quite as heavy looking with the lighter biscotti color. your finds are always pure genius!! i DO have to say that i prefer the color of MIA! so cute!! Always a saver. These are so cute! I love these...so gorgeous! I don't mind the light color one bit, so I'm going to be saving! cute shoes, I think I like the cheap ones more! They are both amazing so I am gonna have to go with the cheap version on these! Such gorgeous wedges!! I love the MIA ones. They're such a lovely colour. These are both gorgeous! Obviously, I would buy the less expensive pair. You can't even tell the difference! Ha, I doubt I'd wear them much, so I'm going to say the cheaper ones. 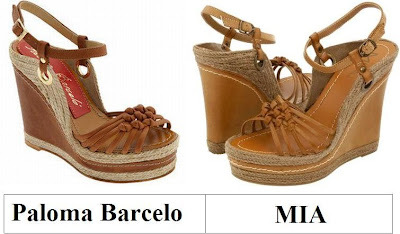 Omg I love theseee, I’ll go with the Paloma ones, love the darker brown color, they are so cute! I would happily wear either pair! I have to go with the Paloma ones -- the color is spectacular! Love this wedge. I would never save when it comes to wedges.... definitely the Paloma Barcelo. The MIA pretties would do just fine for me! So cute! Nice find! Of course I'd for the save! I think the Palorma barcelos are just a beautiful. I think those cheaper ones would be just as great! the detail in the front is quite cute--i like both! love the Paloma Barcelo sandals!